Set in a historic palazzo in historic central Florence, Hotel Helvetia & Bristol is a 5 minute walk from the Duomo and Ponte Vecchio. 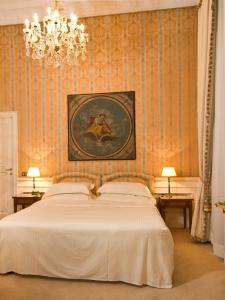 It offers elegant rooms with antique furniture. With luxurious chandeliers and wooden furniture, rooms have a unique character. They come with a marble bathroom, air conditioning and flat-screen satellite TV. The Hostaria Bibendum restaurant features Art Nouveau-style decor and a terrace overlooking Piazza Strozzi. The Winter Garden has an original stained-glass roof. Both serve Mediterranean cuisine. The Helvetia & Bristol Hotel is 300 ft from the famous Via de Tornabuoni high-fashion shopping street. Santa Maria Novella Train Station is a 10-minute walk away.